Lend a Hand All Year 'Round! Volunteering during the holidays gets kids in the habit of helping those in need, but so many families do it that most charities see a huge surge in donations and participation each December - it's every other time of the year that they need attention. Here, three ways to get your family to do good and keep up the bighearted action in the off-season. Start a Charity Tradition Idea #1: Many churches and soup kitchens prepare Christmas dinners for the needy; just call ahead to find out how your crew can pitch in. Keep It Going Idea #1: Fight hunger throughout the year by volunteering one afternoon a month at a food bank. For locations, visit feedingamerica.org. Start a Charity Tradition Idea #2: Help make wishes come true by assisting with a holiday toy drive for needy kids in your area. Go to secretsanta.org for events near you. Keep It Going Idea #2: Sponsor an underprivileged child abroad and make an ongoing impact on her future. Click on savethechildren.org for info on getting involved. Start a Charity Tradition Idea #3: Brighten up a nursing home by bringing homemade decorations (think paper snowflakes, garlands, etc.) for residents' rooms. Keep It Going Idea #3: Check in with the home's volunteer coordinator about activities your family can help out with regularly, like craft sessions or reading hour. Found you on Friday Blog Hop and am now following on GFC (“carmen”). Would love if you’d like to follow my blog back! Great Site!! Now following you from Blog Hop!!! We would love it if you would stop by our site too!! stopping by from blog hop friday! i gfc follow! I like ‘adopting’ a family for my holiday volunteer project. 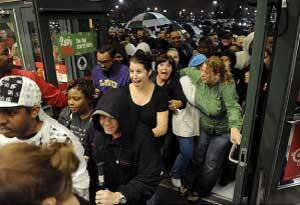 Black Friday Store Hours and Early Bird Specials for 15 Major Retail Merchants!